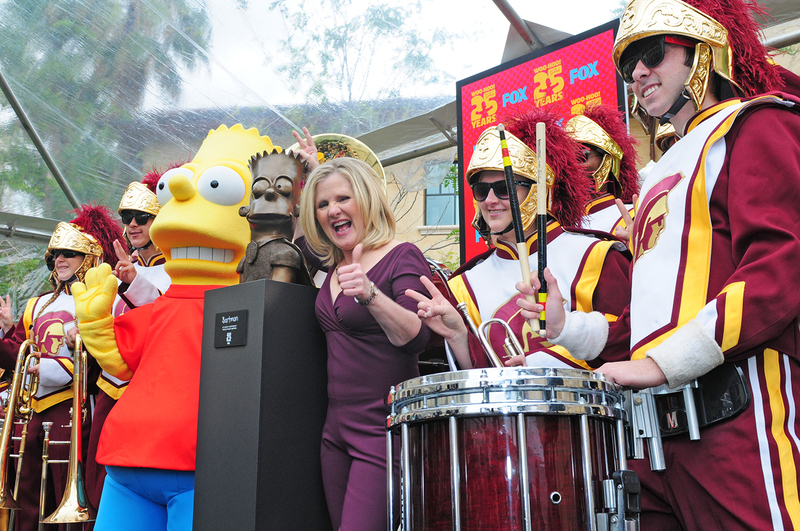 Nancy Cartwright, (Center) with Bart Simpson and the USC Marching Band. Photograph by Vince Gonzales. Bart Simpson will forever have a home at the School of Cinematic Arts. It’s hard to imagine the ascendant landscape of modern animation without The Simpsons. In its remarkable 25 seasons on the air, it has become a cultural touchstone, referenced and revered in every kind of media. Its writers’ room has been a proving ground for countless comedic minds turned TV powerhouses, such as Greg Daniels, Mike Scully, and Conan O’Brien. Even today, few shows have been as effective at blending sharp satire, slapstick gags, and warm family comedy so seamlessly. Over the years, the show has won all kind of awards and unique distinctions, from earning over 31 Emmys to being the first animated show ever to win a Peabody Award, to having episodes immortalized and discussed in depth in theological textbooks around the world (see: season four’s episode, “Bart Sells His Soul”). Longstanding fans of the series praise the show’s wit and adaptability, while some critics may deride it, with no small amount of irony, as the “Worst. Show. Ever.” – a phrase that one of the show’s hundreds of satirical side characters, Jeff Albertson (aka Comic Book Guy), coined and cemented into the pop culture pantheon. In either case, the show’s decades-long influence is still unquestionable.